This review will contain spoilers for Volumes 3 and 4 of RWBY. Qrow, Ruby, Jaune, Nora and Ren have now made it to Haven Academy with the intention of seeking the help of their headmaster to stop Salem’s goal of obtaining the missing Spring Maiden and the relic that lies underneath the Academy. However, the group have reasons to be wary of the headmaster, and need all the assistance they can get to gain the upper hand. Luckily, Ozpen is back and ready to take the fight to Salem, however with the lack of Hunters, and the White Fang closing in on Haven, who will ultimately triumph? 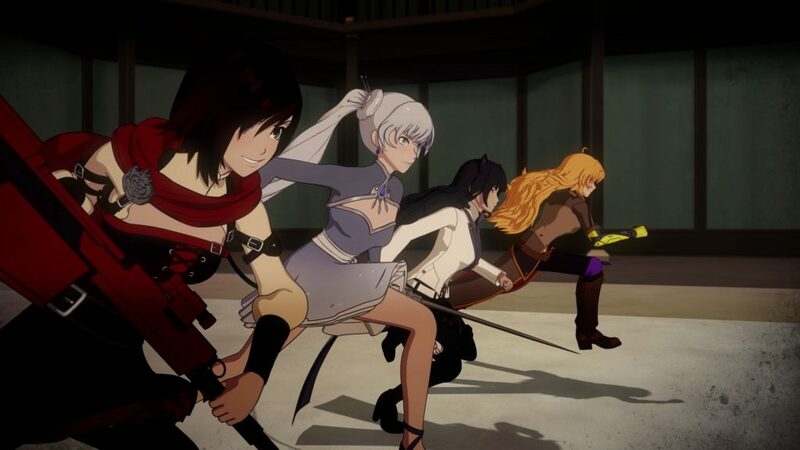 Each volume of RWBY, despite being part of one continuous story, has felt very distinct and they have played out like separate seasons with their own beginnings, middles, and endings. Volume 5 however, feels less like a separate season and more like ‘Volume 4 Part 2’ as it picks up right after where Volume 4 left off, with many stories, such as Blake’s and Weiss’ dropping the audience right in the middle of their respective conflicts. Volume 4 did try to have its own conclusion, with many emotional arcs wrapping up to serve as its ending, but as a result, Volume 5 plays like it’s just come back from a middle season break and starts as it means to go on, by charging right into the action and pushing forward with the plot. This might be a good thing for those who were less keen on the more emotionally-arc driven Volume 4, in practice however Volume 5 suffers from several issues that ultimately make this season fall a little flat. As Volume 5 doesn’t have your typical ‘beginning-middle-end’ structure, it’s not building towards a big twist or battle as much as the previous volumes did. In fact, it plays a lot of mid-season or late-season cards very early on, such the villain Adam betraying his own and scheming for the White Fang leadership role, and whilst it’s good to shake up audience expectations, doing so too often or at the wrong moment can have the opposite effect. The pacing of Volume 5 is easily the weakest aspect of it as the ebb-and-flow of what it should be is all wrong; one minute RWBY is in your face with fast-paced action, then randomly decides to stop to have a long and slow exposition dump. This is especially noticeable between Episodes 8 – 10. Blake’s home is under attack by the White Fang, her own family is in danger and her former best friend is behind it. There’s real emotional stakes here, however it’s poorly spread out over three episodes simply because the show pauses the action to jump cut to the other characters to update the audience on what’s happening with them. This makes the battle lose tension and not seem as important in the grand scheme of things, especially as the fight itself could have easily been shown in a single episode if the production team had allowed it to progress naturally, rather than constantly pausing it. Large ensemble shows such as The Walking Dead and Game of Thrones often have the same problems of huge casts and multiple, sometimes unrelated stories happening at once. But they sometimes have episodes that just focus on one group of people, allowing the action and tension to resolve or build naturally, and only in the next episode do we get to see what the other characters have gotten up to. RWBY should have taken this course, and because it doesn’t, it suffers for it. Another strike against this season are the fight sequences, that were once one of the highlights of the show, have now gone noticeably downhill. In my review of Volume 4 I mentioned that some fights struggled to juggle multiple participants at once, and this has not improved here. The final fight sequence especially, which lasts over four episodes, badly handles over a dozen characters supposedly battling each other all at once, and that’s not including a large group of Faunus led by Blake having their own conflict just outside. The characters have a terrible habit of just standing there, watching others fight, or stopping mid-battle to talk either at or with each other. When the fights are one-on-one, the choreography manages to shine through and the thrill starts to come back, but as soon as more players are introduced it becomes a visual mess. That’s not to say that this volume season is a dud however; even though the pace and thrill of the action scenes are badly interrupted, the smaller and more intimate character moments still shine brightly. This especially works when the members of team RWBY finally and slowly start coming together since the end of Volume 3, and the reunion for the most part is touching and well earned considering all we’ve been through. Even the villains get their moments as Cinder, who took a major back seat in Volume 4, gets to remind the audience why she shouldn’t be messed with, and Raven, the mysterious dark-haired maiden who previously appeared in Volume 2, now comes into play at full force and in the most unexpected ways. She’s a welcome addition to the cast, even though she isn’t a sympathetic character. Another major new character addition is Oscar, whom the audience first met in Volume 4 but in increments and his role wasn’t so crystal clear. Now he plays a major part in the central conflict as the host of Ozpin, and his character, whilst an interesting addition, is a bit of an enigma. Oscar himself is Everyman, the boy who’s been thrown from his quiet farm life into a destiny he never could have imagined. But the man possessing him is a veteran fighter and one who knows a lot more than all the cast members combined. So we have the audience surrogate and the mysterious advisor role smashed into one character, and it’s an odd combination that doesn’t always work. On one hand it’s great that a fascinating man such as Ozpin is able to come back, as he clearly died way before his time, but bringing him back in this fashion, with Oscar having many Mary-Sue tropes hanging around his neck, is a lot for the audience to swallow. It’ll be interesting to see where Volume 6 takes these characters from here, but there’s still a lot of work to be done to make him feel like a natural part of the team, rather than a shoe-horn in. Weirdly for this release, Rooster Teeth decided to remove the movie feature, so instead of watching all the episodes together with all the intros and credits removed, they’re now just the episodes played back to back. As the episodes aren’t that long, and the intros are not their own chapter within the disc, it can be very annoying to manually fast forward each and every credit sequence just to get to the episodes. Whether it’s DVD or Blu-ray you’ll be investing in, there’s two discs; the first disc has the episodes with English subtitles, plus writer/director and crew commentary. 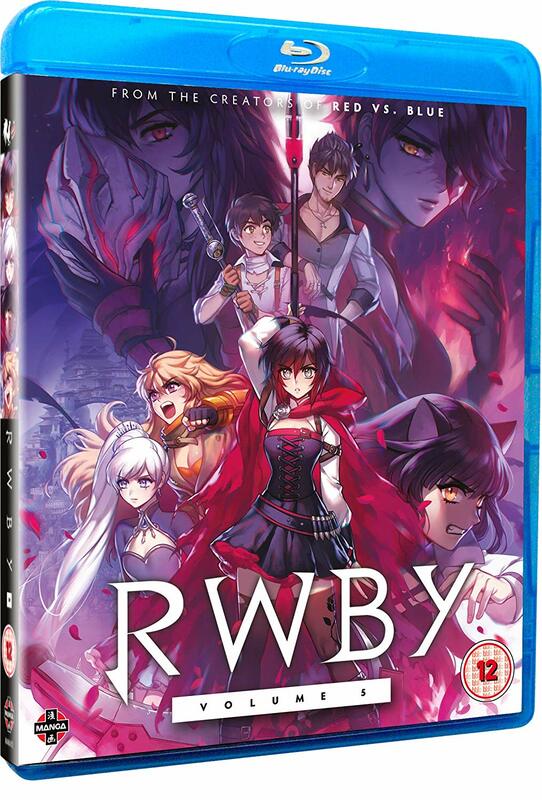 On the second disc you’ll find character shorts for Weiss, Blake and Yang, a ‘5 years of RWBY’ featurette which explores the history and legacy of the show so far, crew photos as well as multiple shorts that go behind the scenes of the show. 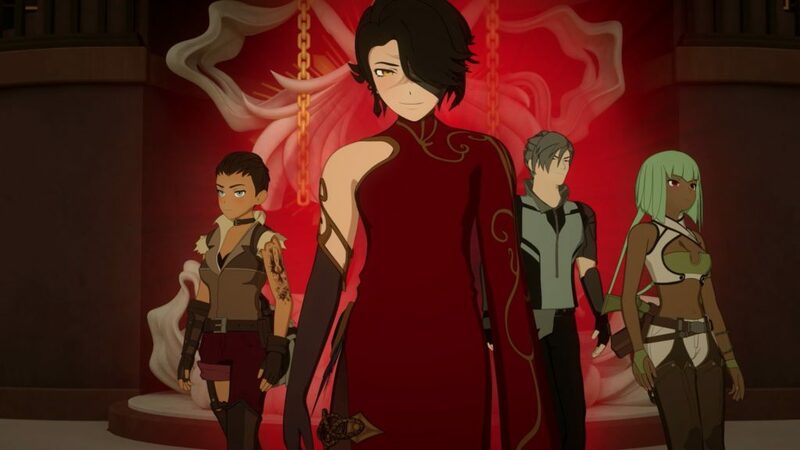 RWBY Volume 5 juggles a lot of elements that ultimately don’t always pan out: its bad pacing, drop in combat quality and odd character decisions make this one of the weakest seasons so far, despite it having a lot of game-changing moments, but I hope this is merely a blip on the radar and not a sign of things to come. This first anthology of manga stories is an entertaining, varied and funny read for all RWBY fans out there. It’s clearly made with love of the series at the heart of its creation, so if you’re a fan, it’s worth picking up. RWBY Volume 4 may not be as explosive and dark as Volume 3 but it’s a great follow-up that properly sets up the pieces for the next chapter of the story, with good emotional arcs and fun fight sequences.